Eteachingapps.com - a novel internet platform to create mobile teaching applications for higher education. Mobile e-learning is increasingly used in undergraduate medical education. However, high costs and complexity to develop software applications (apps) for mobile devices limit their use and prevalence in higher education. Approximately 80% of undergraduate medical students at TUM own a smartphone or tablet-PC (Kühbeck et al., 2014). Our objective was to develop a internet platform for educators to independently create and manage teaching apps without the requirement of programming skills or additional software. Eteachingapps.com was developed at Technische Universität München (TUM) based on Hypertext Preprocessor (PHP) as server-side scripting language and a My Structured Query Language (MySQL) database management system. Eteachingapps is accessible via the open-access website https://www.eteachingapps.com (German version: https://www.eteachingapps.de). Educators can create their own teaching app and instantly edit its content online. Students can access the apps with a webbrowser on any internet-enabled device (smartphones, tables-PCs or laptops). Figure 2. App administration panel. 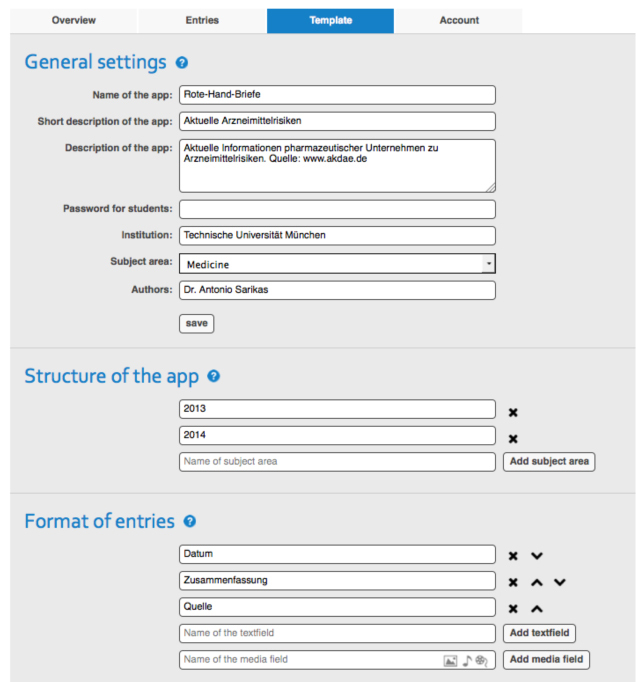 After log-on, the “overview” page of the app administration panel conveys general information about your app (name and description, hyperlinks for app access). 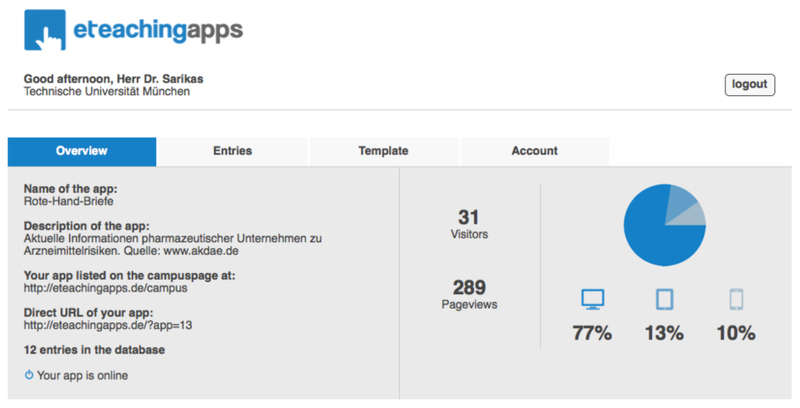 In addition, user statistics on the overall number of visitors, pageviews and the kind of devices used to access the app (desktop-PC and laptops, tablets or smartphones) are displayed. Flags link to the sub-pages “Entries” (for content management), “Template” (for app configuration) and “Account (to manage user information). Figure 3: App configuration. In “general settings” name and description of the app can be stated. Optionally, a password can be set to restrict access. In “structure of the app” the general outline of the app (e.g. chapters) can be defined. In "format of entries" the outline of the web form for individual entries can be defined. Both text- or media boxes (for audio, video or picture files) can be added. 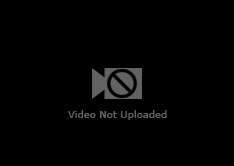 Figure 4: Content management. In ”entries” app content can be added via the user-configured entry form. 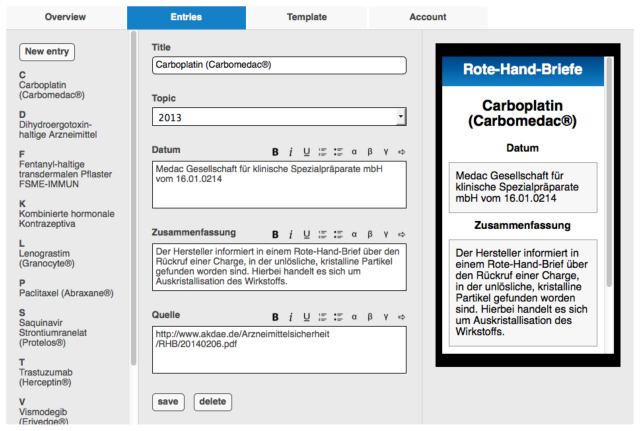 Both text and media content can be added. All changes are immediately online and can be accessed by the students. 292 of 390 (74,9%) 3rd year medical students at TUM participated in the survey. The vast majority of students (81,9%, 220 of 267) gave an overall rating of the eteachingapps pilot app www.tum300.de of "excellent" or "very good". The functionality of the app was rated “excellent” or “very good” for usage on smarthpones (80,5%, 111 of 138), tablet-PC/iPad (81,6%, 84 of 103) or desktop-PC/laptop (93,2%, 234 of 251). 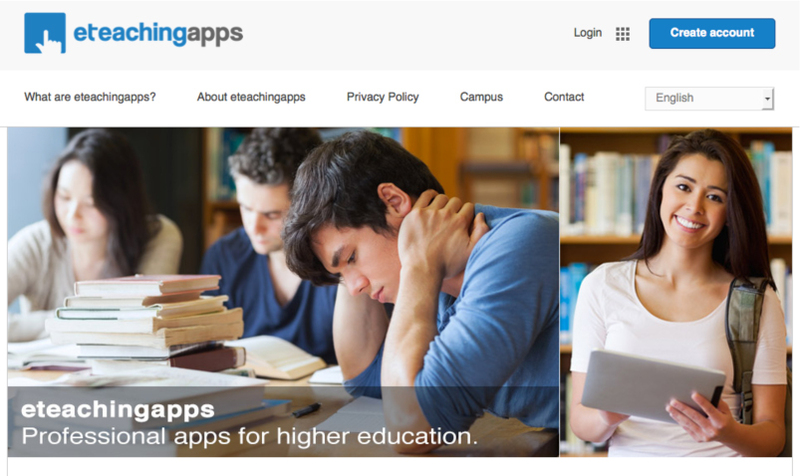 Eachingapps.com is a novel platform to independently create, edit and manage teaching apps for higher education that was well received by students and educators. As a non-commercial alternative to conventional apps, it will likely help to foster mobile e-learning in undergraduate medical education.